Driving productivity starts with a clear vision, direction and goals. Productivity of even the best team will be zero if their efforts are misplaced, e.g. if the software they develop will not be adopted. The vision should clearly articulate expected benefits. Having transparent goals has an added benefit of enabling individual and team creativity in finding the best ways to achieve the goals. A common anti-pattern in product/project management is frequent, unwarranted changes in priorities. Direction changes are expensive. They result in a throw away work which by definition has no value, add an overhead of context switching (ramping down on one activity and up on another takes time) and impact team morale. Software engineering organizations need to be agile, changes are expected and frequently good. Agility should not however be mistaken with pointing teams in different directions as a reaction to a stream of random requests and ideas or creating an emergency due to a lack of foresight. Please refer to my earlier blog post on an Agile Product Management Process for an example of how to manage change in a productive way. Time spent on reacting to operational issues and fixing bugs creates no incremental value. Reducing it has multiple benefits. It frees time for innovation, i.e. creates an opportunity for the team to produce more, energizes the team members and makes it easier to attract talent (developers prefer working on a new rather than maintaining the old code). There is more to driving productivity. Development processes and tools, increased reuse, better working environment etc. can all help. From my experience however the biggest impact comes from having a clear, value oriented strategy and minimizing the unproductive time. It boils down to a strong engineering and product/project management leadership. If you design APIs, I would highly recommend reading “Web API Design: Crafting Interfaces that Developers Love” by Brian Mulloy. The book focuses on RESTful APIs and covers designing methods signatures, handling errors, authentication, versioning etc. It is clear, logical and concise. At just over 30 pages, you can read it in less than an hour. It will help you design elegant, easy to use APIs. Engineering excellence is about delivering software you can be proud of. Great software has features supporting well articulated business and user needs (see Product Hierarchy of Needs: Winning, Keeping and Growing Business). Having great features however is not enough. Quality characteristics such as usability, uptime and performance drive user satisfaction. Well thought through processes create an environment in which teams can not only deliver but also exceed user expectations. This post introduces continuous improvement process for assessing and driving engineering excellence. Product/Project Management Do we have clearly articulated goals and measures of success for every project? Do we have clearly articulated scope for every project? Development Do we have predictable and repeatable process? Do we have clear doneness criteria? Do we have any impediments to productivity? Source Code Management Do we have an effective branching model? Release Do we have zero downtime release process? QA Do we have 100% code review coverage? Do we have 80%+ automated unit test coverage? Do we have 80%+ automated integration test coverage? Do our staging environments adequately represent production environments? Monitoring Are we alerted to all critical issues? Are we warned before issues become critical? Exception Handling Are all exceptions handled? Logging Do we have gaps in logging? Backup Is all data backed up? Disaster Recovery Will our applications stay up when an entire data center goes down? User Satisfaction Do we have user satisfaction gaps? Uptime Do we have any single point of failure? Do we comply with uptime SLA? Performance Do we have clearly articulated performance SLAs? Do we regularly test performance? Scalability Do we understand how much load can our systems handle? Do we regularly stress test? How quickly can we scale? Security Do we have any security exposure? Regulatory Compliance Do we have any legal exposure? Code freeze, in which no changes are permitted to a software system, is a policy often used to reduce risk. Any changes to code or configuration may have unintended consequences and introduce bugs. Code freezes help to ensure that the system will continue to operate without disruptions. They are for example commonly used in the retail industry during holiday shopping season when systems load is at a peak. Business agility is impacted as business is constrained in what they can ask software teams for during the code freeze. Time to market is elongated as feature deployments are delayed till after the code freeze. Software team productivity goes down. Any bug fix deployments are more time consuming while complying with the code freeze policies, code merges can become more complicate, system integration and QA of new features is disrupted or at least delayed. Subsequent release becomes more risky as a larger backlog of features gets deployed after the code freeze. This begs a question. Can code freezes be avoided? The answer is yes. State of the art is continuous deployment – multiple production releases a day, five days a week, every week, i.e. no code freeze required. Comprehensive test automation including unit, integration and performance testing. Zero downtime release process. This requires particular attention to any database changes. Robust monitoring with warnings issued when system’s health deteriorates but well before it becomes a real issue, and critical alerts sent when the system requires immediate attention. When not to use db:migrate? An overview of a fast-pace product development process. 1. Product requests and ideas are collected using a variety of sources and techniques. They come from customers and internal stakeholders, and are gathered using brainstorming sessions, interviews, online feedback capture, focus groups, analysis of sales win/loss reports and support cases, competitive analysis etc. Product requests and ideas are captured as Wishlist items. Note: there is a separate escalation process to handle requests of urgent nature, e.g. issues impacting customers. 2. Wishlist is prioritized every six to seven weeks (twice a quarter). For an overview of the prioritization process please see The Art and Science of Product Prioritization. 3. Items selected during a prioritization session are moved to the Design Queue for analysis, requirements definition and design. Output of the design process consists of lightweight documentation, wireframes and visual comps (where needed). 4. 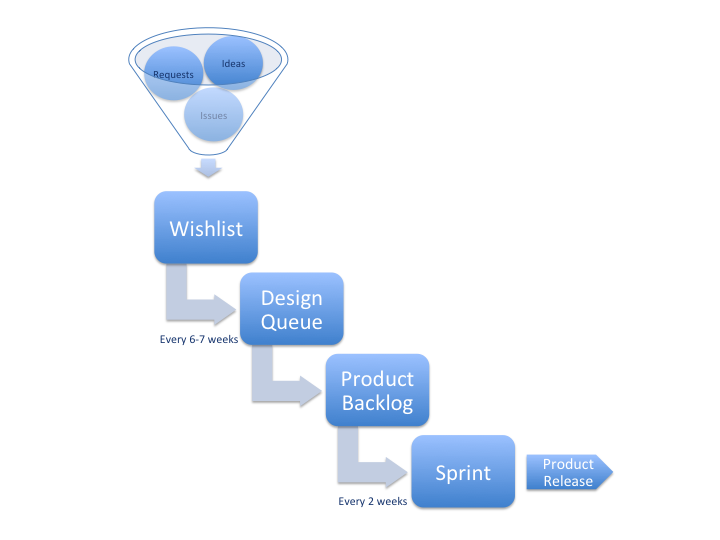 Once an item design is done, it is moved to the Product Backlog. 5. Every two weeks, Engineering Team selects items from the Product Backlog for implementation in a bi-weekly sprint. Our Development Process post provides more details. 6. Product enhancement and fixes are deployed to production every 2nd Wednesday. Release notes and updated documentation are published on the Help Center shortly after a release. All new developers joining my team start coding on day one, and complete the first set of tasks/commit code on day two. I found that the most effective way of getting new team members up to speed and productive is by getting them to code right away. I start by assigning a set of simple bug fixes and tiny enhancements. The tasks are selected to touch various parts of the code base. Coding tasks provide a clear focus and beat other methods of getting up to speed such as reading documentation and browsing through the code base. Keeping them simple provides a set of quick to achieve goals and the resultant sense of accomplishment is a powerful motivator. Careful selection of tasks provides a good exposure to the breadth of the code base. We start getting business value on day two. Keeping the tasks small minimizes risks. We use a bi-weekly, scrum based, agile process (see Our Development Process). Throughout the developer’s first full sprint I gradually increase complexity of the tasks. At the beginning of their second full sprint, they are ready to start selecting work on par with the other team members. The approach is very effective and sets the tone for a high performance team culture. What is your method for on-boarding of the new team members? Next in order of popularity were Top Chart Libraries, git-flow with rebase and Running distributed cron jobs in the cloud. Visitors came from 146 countries led by United States, India and United Kingdom.